Perform Better has come up with an easy way to keep your weight vests organized in your facility with its new Weight Vest Racks. 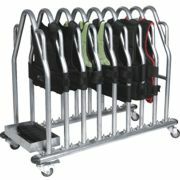 The Vest Rack with Wheels can hold up to nine weight vests of any size and has castors for easy movement. The bottom storage shelf can hold additional weights as well. If you are looking for something smaller, the new Wall Mounted Vest Rack can store two weight vests off the floor and mounts easily to any wall. Leafview are environmentally friendly trash receptacles with contemporary designs that complement any décor for high-profile areas. The products feature disposal areas on both sides of their stainless steel bodies, and are designed to withstand various weather climates. Commercial Zone's new Leafview receptacles offer building owners, managers and developers the opportunity to enhance the exterior aesthetics of their property. American Muscle Docks introduces the Simple Dock—a three-step super-easy, do-it-yourself floating boat dock. 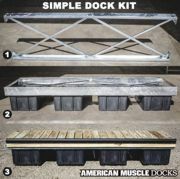 American Muscle Docks has taken the guesswork out of building your own dock with its version of a simple bolt-together rigid box frame system. The lightweight rigid frame makes attaching floats and lumber easier than other complicated kit docks. The goal was to create the most effortless and strongest assembly floating dock on the market. Simple Dock Kits come in 10-foot sections with widths available in 3, 4 and 6 feet. Land Pride introduces two new models of Snow Pushers. The SSP15 and SSP25 Snow Pushers are available in three popular sizes to fit your skid steer or tractor loader. The 15 Series is manufactured with a 30-inch, 10-ga. moldboard and Ľ-inch side panels with three models available in 72, 84 and 96 inches. The 25 Series is a step up with a 3/16-inch thick, 35-inch high moldboard, 5/16-inch side panels and is available in 96 inches, 10 feet and 12 feet. All models come equipped with AR400 skis shoes that are adjustable, reversible and replaceable. The DuraSplash™ Water Play Surface is formulated with greatly enhanced chlorine and UV resistance. This innovative, nonslip safety surface is durable and low-maintenance. Its bright colors and design versatility will add excitement and play value to your splashpad.